"Each flexible silicone tray in this four-pack holds 14 cubes and comes with a removable lid to prevent spills and keep freezer odors away." "Press the liner into the glass, pour in a liquid, and experience your first ice-lined glass. It gives whiskey on the rocks a whole new meaning." "This set includes two molds: one for creating two-inch cubes and one for crafting ice balls." "Any drink that perks up with a squeeze of lemon or lime would benefit from this citrus ice cube set." "This clever silicone mold creates ice strips that break easily into an 8-ounce single serving of crushed ice." "Conveniently, this OXO Good Grips No-Spill tray comes with a sealable lid, so you can store your trays on an angle without creating a mess." "This tray, which comes as a set of three, makes 60 tiny ice balls." "Guests will be impressed by the way these diamonds reflect the light while floating in their drinks." "This amusing silicone mold churns out ice shaped like a guitar. The plastic stir sticks act as the guitars’ necks." This four-pack of ice cube trays makes it easy to stock up enough ice for your next party or event. Each tray holds 14 cubes and comes with a removable lid to prevent spills and keep freezer odors away. Plus, the tray’s flexible silicone material allows the cubes to pop out easily. Instead of twisting it (and spilling your ice everywhere), you can press each compartment individually to remove the exact number of cubes you need in the moment. These BPA-free, dishwasher-safe trays stack easily in the freezer without sticking to save space, too. If you're a fan of bigger cubes, you can also opt for the brand's "bigger cube" trays that create larger pieces of ice for your drinks. At under $15 for four high quality trays that will last you for years to come, these trays are a surefire steal. We bet you haven’t seen something like this before: It’s a mold that allows ice to freeze directly to the walls of a rocks glass. Press the liner into the glass, pour in a liquid, and experience your first ice-lined glass. It gives whiskey on the rocks a whole new meaning. And you don’t even have to freeze plain water. Experiment with new cocktail flavors by freezing juice or flavored water. You can create a new take on a Bloody Mary by freezing spicy tomato juice to surround your vodka or make a Manhattan with a twist by freezing bitters and Maraschino-infused water. It’s good to have a few different ice options at your disposal if you drink at home frequently. This set includes two molds: one for creating two-inch cubes and one for crafting ice balls. Both large cubes and spherical ice are perfect for strong drinks that you don’t want to dilute too quickly (think Old Fashioneds and Sazeracs). Big ice pieces melt slower and, therefore, add less water to the drink over time. If you’ve been to an in-the-know bar recently, you’ve likely experienced this ice trend. These molds bring it right to your home. Any drink that perks up with a squeeze of lemon or lime would benefit from this citrus ice cube set. It comes with an attachable reamer that sits on top of the tray. The free-flowing juice then trickles down to each wedge-shaped compartment. There are two trays in the set so you can make up to 16 tangy ice pieces at a time. Pop a few into your gin and tonic or gimlet (or even a glass of water!) the next time you want a drink that gets more flavorful with time. Crushed ice is great for mint juleps, tiki drinks, Moscow Mules or any other strong or syrupy drink that needs quick dilution. But crushing ice on the fly can be a pain. This clever silicone mold creates ice strips that break easily into an 8-ounce single serving of crushed ice. You squeeze the mold so the ice falls out in shards. Then, direct them into your glass using the included lid that doubles as a funnel. 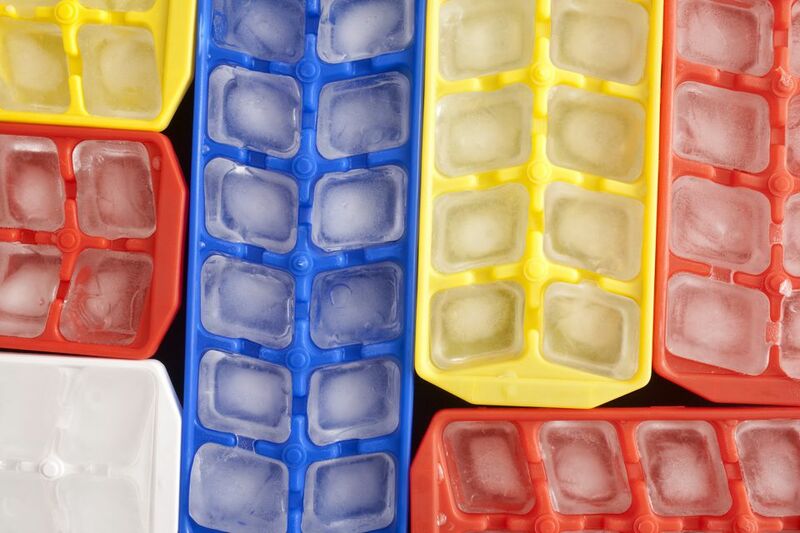 Ice cube trays create a problem in a disorganized freezer: They need to be placed on a completely flat surface to prevent spills. That means you have to push aside your bags of frozen vegetables just to accommodate a dozen or so ice cubes. Conveniently, this OXO Good Grips No-Spill tray comes with a sealable lid, so you can store your trays on an angle without creating a mess. The lid keeps your cubes from absorbing unpleasant freezer odors and it comes off for to be cleaned on the top rack of your dishwasher. The tray makes 14 cubes in all. Small cubes are best for drinks that are gone before you know it — drinks like a glass of iced tea or a mojito. Small ice melts fast and you’ll need to make your drink disappear with some speed if you don’t want it to be watered down. This tray, which comes as a set of three, makes 60 tiny ice balls. Adults can toss them into their favorite cocktail and kids can have fun playing with them in their next cup of juice. Elevate your next cocktail with diamond-shaped ice cubes. Just close the two-sided, food-safe mold and fill each compartment with water using the included funnel. Once they’re frozen, the diamonds should release easily from the silicone surrounding them. Use this tray for a small dinner party (since you can only make four pieces) or a classy night in. Guests will be impressed by the way these diamonds reflect the light while floating in their drinks. Who knew ice could actually be fun? This amusing silicone mold churns out ice shaped like a guitar. The plastic stir sticks act as the guitars’ necks, plus a way for you and your guests to mix your drinks as you move around the room. The mold makes three ice guitars and serves as the perfect gift for the musician in your life.